Of all the birthday presents I’ve received, my 12th birthday gift was the most memorable. That afternoon, I came home from school, opened my bedroom door, and gasped with delight. 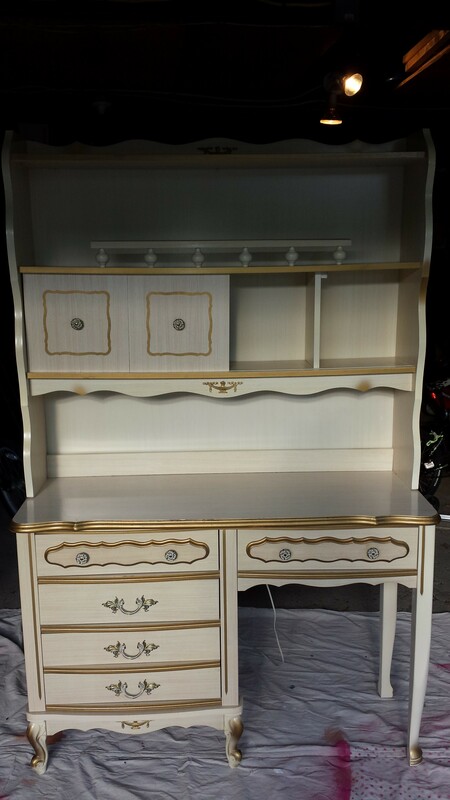 If you were an American girl growing up in the 1980s, you’ll remember the ivory, gold-flecked Victorian-style bedroom set. If you didn’t have one, I’ll wager at least one of your friends did. Mine came from Sears and I loved, loved, loved it! I nearly forgot to take a picture of the before! My beloved bedroom set moved to Illinois during my college years. 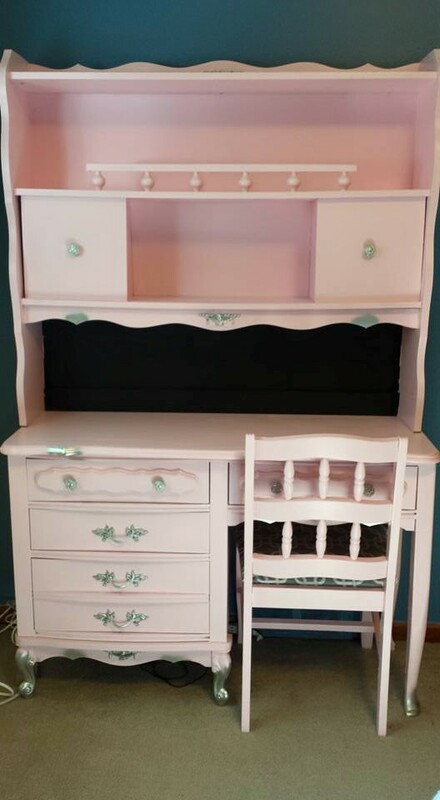 It also lived in my first grown-up, single-girl apartment in the early 2000s, although the desk had become obsolete due to the size of my desktop computer. The CPU tower was crammed underneath, always fighting with my legs for space. The monitor was scooted out to the edge because its highest point was too tall to fit under the hutch. For the last 15 years, the set has resided in my parents’ guest room. My parents are getting ready to move to a smaller house. Meanwhile, I’m pursuing my blogging/public speaking dream while living in a very small house with no real Command Center. Most importantly, I exclusively use a LAPTOP. My cherished desk is available and needed again! I loved the pink and gray color combo so often seen in the 1980s. I’m so happy it’s back! Isn’t it glorious? I washed, sanded, and primed before painting. 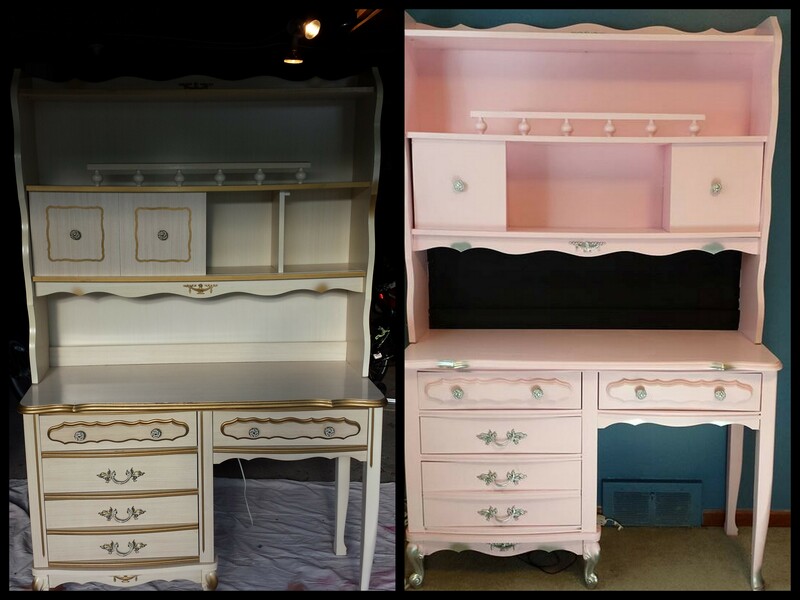 The project required 2-3 coats of pink paint. A can of metallic silver spray paint added a nice touch to the hardware and trim. My least favorite task was painting the spindles on the hutch. It took FOREVER and they’re a little drippy-looking at close proximity. 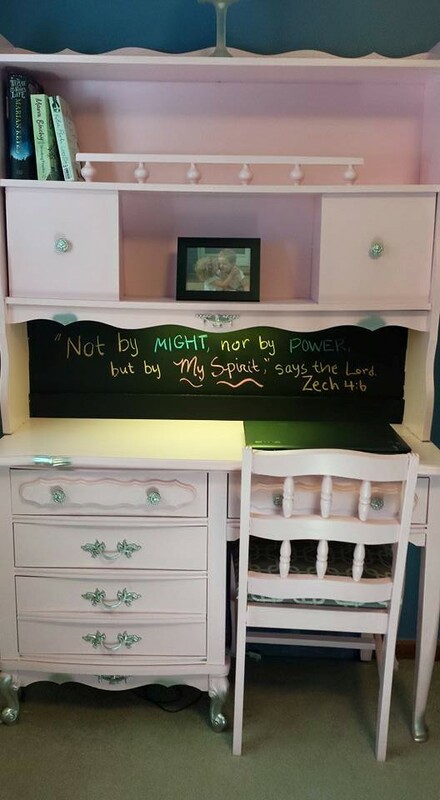 My favorite feature is the chalkboard paint that I used for the hutch. 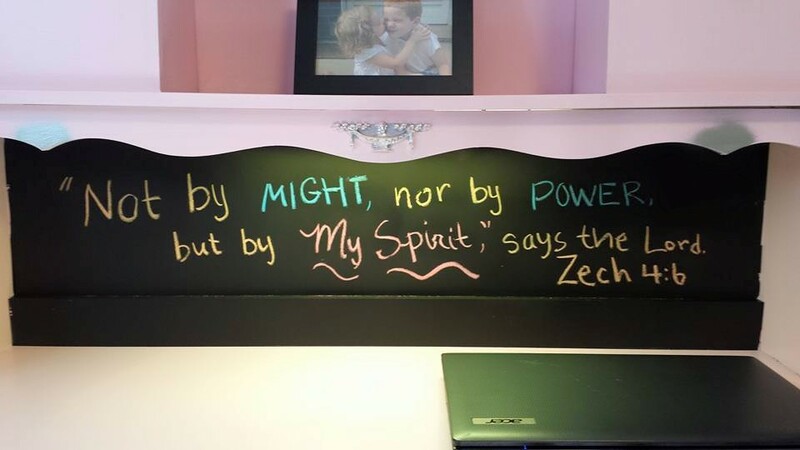 When sitting at the desk, my favorite quotes are at eye-level. I may even use it to make lists sometime. I removed the seat pad before painting the wooden chair frame. Painting the chair required a lot of patience. I kept thinking I had covered all surfaces with paint, but as soon as I made a quarter- or half-turn, I’d discover more unpainted areas. When painting a chair, I recommend you keep looking at it from different angles! I covered the seat pad with a geometric-patterned gray and white fabric. The new fabric went right over the old. I’d suggest trying a staple gun. I don’t own one, so I drilled tiny holes into the perimeter of the seat pad’s wood bottom. Then, I inserted upholstery tacks into the pre-drilled spots and pounded the heck out of them. That took about an hour and I bent several of the tacks to the point of being unusable, but I’m thrilled with the results. 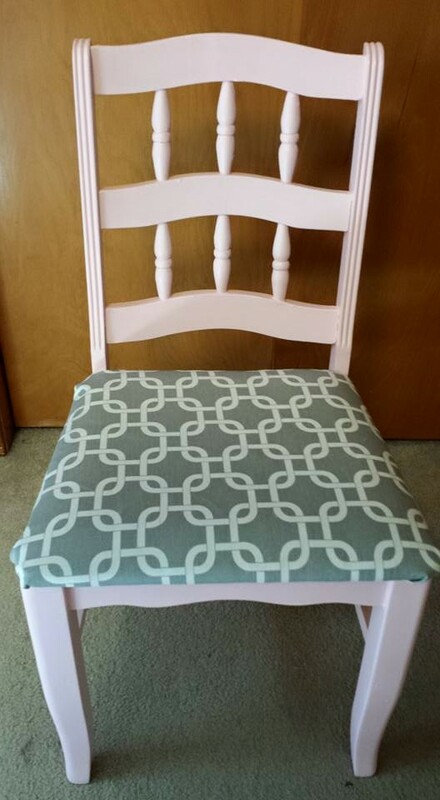 I hope this post inspires you to customize and upcycle something dear to you. I can’t wait to see your pics! Thanks for the feedback, Tammi! I look forward to seeing pictures. Good luck.